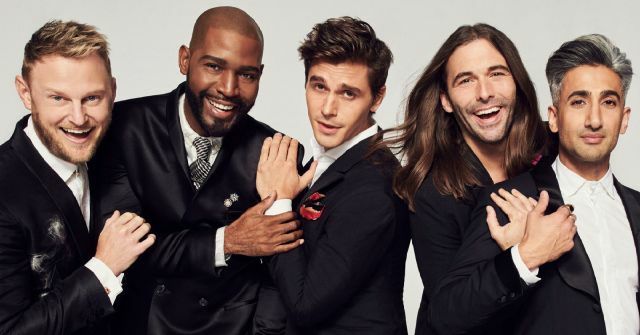 The “Queer Eye” reboot is right around the corner. Remember the early 2000s, when “Queer Eye For The Straight Guy” was on TV, and you watched it and thought out loud, “I would never wear what Carson is pushing on that poor hetero man” and also, “Why does the straight bear have to shave his back?” Well, you don’t have Carson to push around this time because there’s an entirely new cast of makeover gays to yell at when Netflix’s “reimagined” version of the show launches in February 2018. The shtick is the same: slobby straight guys get themselves zhuzhed by a team of homosexuals whose specialties are fashion, grooming, design, cooking, and culture. Word is this time around the intrepid queers are invading Red State territories, which kind of raises the question of why we would even want men who voted for Trump to dress better and blend in with decent society. But apparently the producers have some Better World ideals, so we’ll just wait and see how it all plays out. There can’t be a discussion of LGBT documentary filmmaking without the inclusion of Rob Epstein and Jeffrey Friedman. Whether individually or collaborating, they’ve been responsible for landmark queer films like “Word is Out,” “The Times of Harvey Milk,” “The Celluloid Closet,” “Common Threads,” and “Paragraph 175.” Their latest, set to premiere at the 2018 Sundance Film Festival, is called “End Game.” This one seems to be taking a detour from queer subject matter, though, as its logline explains the subject to be “visionary medical practitioners working on the cutting edge of life and death.” We’re going to guess that this has something to do with becoming immortal, which any queen on “RuPaul’s Drag Race” will tell you is already part of her long-range career plan. Either way, we’re in because these two directors have a flawless pedigree, and because we don’t have to travel to snowbound Utah to see it: Netflix has already picked up the film to begin airing May 4. Moe Berg. Ever heard of him? No? Well, then you’re most likely not obsessed with war history or conversant in early 20th-century professional baseball. But here’s what this fascinating figure did: he was a catcher for a variety of pro teams up until the late 1930s, was an Ivy League graduate, a lawyer, spoke nine languages, and, oh yeah, was also a spy for the United States Office of Strategic Services during World War II. A “confirmed bachelor” who was probably bisexual, he is also the subject of the new film, “The Catcher Was a Spy” from filmmaker Ben Lewin (“The Sessions”). Based on a book of the same name, the film follows Berg’s (portrayed by Paul Rudd) career as he slips in and out of treacherous situations with the aim of giving the U.S. the upper hand against the Nazis as both countries race to build an atomic bomb. The movie co-stars Guy Pearce, Jeff Daniels, Paul Giamatti and Sienna Miller, bows at Sundance 2018, and will probably sneak into your local multiplex later in the year. Japanese comics artist Gengoroh Tagame is, among fans in Western countries, one of the most well-known creators of queer comics, or manga. His recent manga series, “My Brother’s Husband” is the story of a single Japanese father name Yaichi, his young daughter, and Mike, who is Canadian and is the widowed husband of Yaichi’s late twin brother Ryoji. The story is groundbreaking for Japan because it deals with subtle homophobia, familial estrangement, and ideas about marriage to foreigners. And now it’s going to be a live-action limited TV series. Set to air in March 2018, it stars Japanese actor Ryuta Sato as Yaichi and six-foot-six Estonian sumo wrestler Baruto Kaito as Mike (this fits: Gengoroh Tagame specializes in manga about very large and bearish gay men). Given Tagame’s current popularity in English-speaking countries, and the heartwarming qualities of the source material, it’s a safe bet that this series finds a home on specialty streaming or home video not long after.